Don’t worry, it will be traditional by this afternoon. This artwork’s shape and elements are dictated by its site, availability of materials, and time; these are some of the factors that determine a given tradition. I say that it is a traditional practice to be innovative. The composition of Waharoa speaks to the ancestors and forces of nature that are present in this Great Hall. 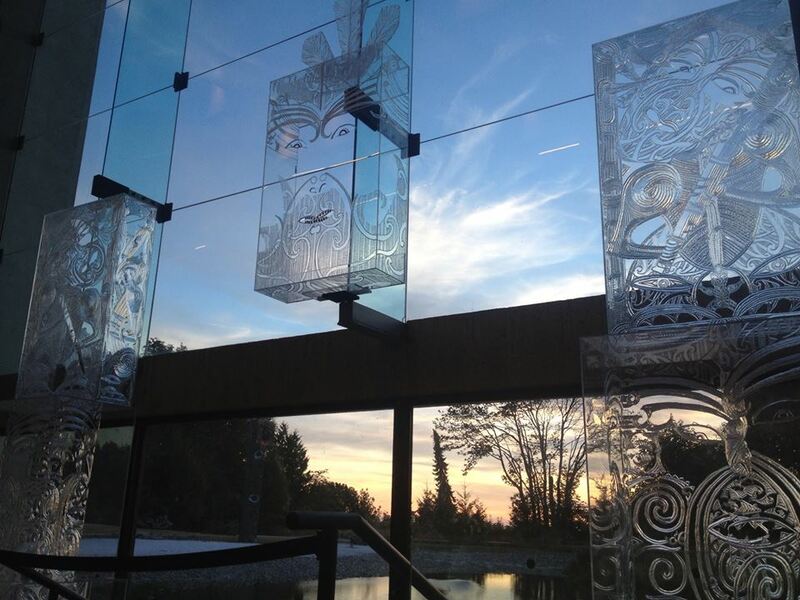 The plexiglass as a material speaks to light and the water that surrounds us; they are the source of life itself. The abalone shell and the white feathers speak directly to the wood that surrounds us – the union of earth, sea and air. The red and black paint, and the cord binding everything together, represent time/space and male/female aspects respectively. 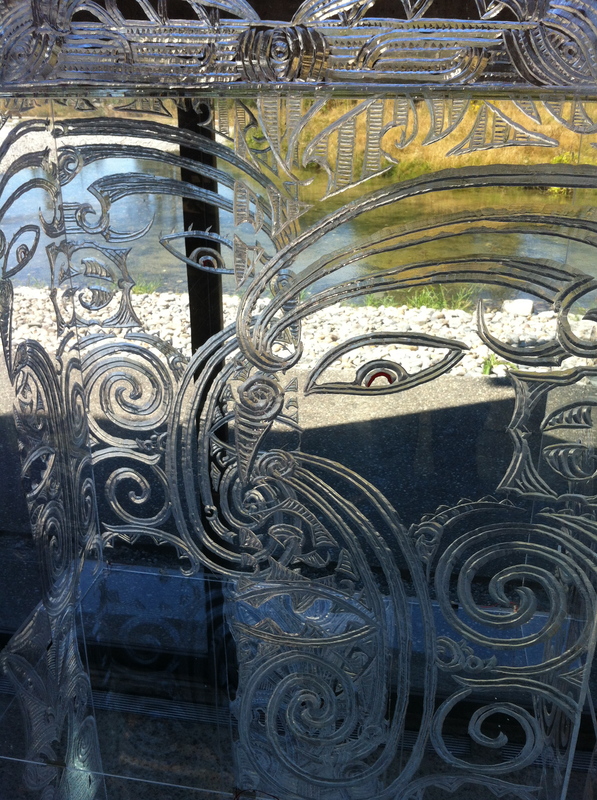 The Waharoa communicates to the people that the past is in front of us and the future we remember. 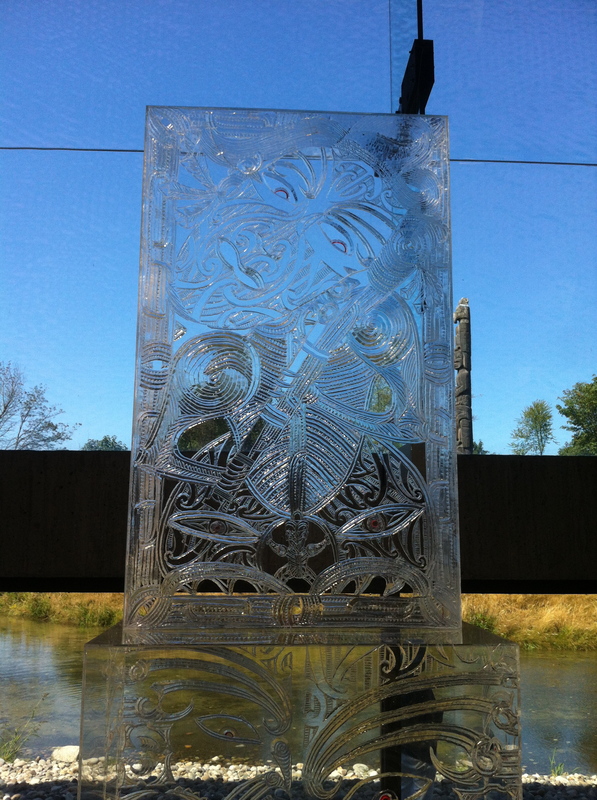 Waharoa is a fascinating work, and I was particularly pleased to be able to see Nuku speak about his practice. I was not at all surprised to hear him speak very passionately about his materials: particularly his use of styrofoam – which he described as “like carving clouds.” Reading his statement for Waharoa, however, one thing that struck me was how much Nuku had adopted the parlance of minimalism (site-specificity, the activation of space etc). The question I kept returning to was whether these (deeply personal) works were antithetical to the aims of minimalism, or whether, in fact, they achieved a more perfect embodiment of these aims than any of the minimalists were ever able to achieve? I have a feeling, that the key to answering this question requires investigating the nature of self- and object-hood inherent in these works. 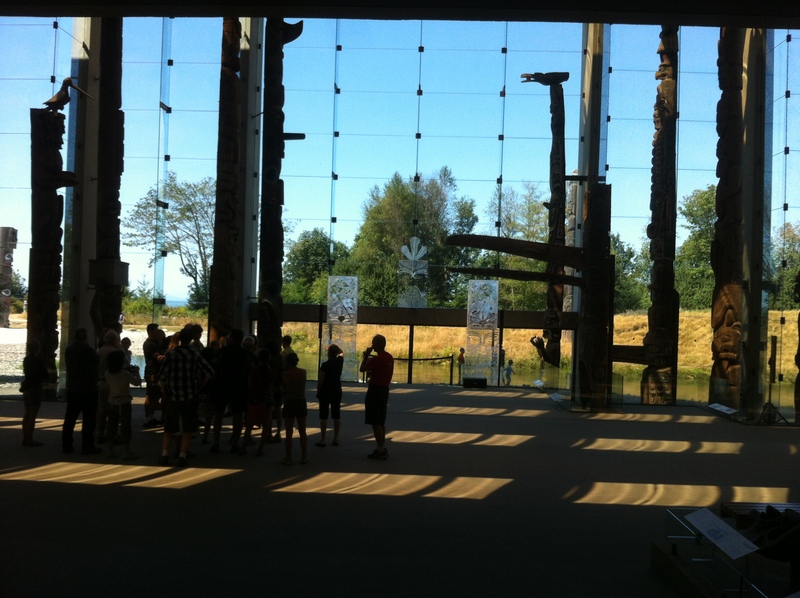 Nuku intimated this in his speech at UBC, Nuku saying, “I carve poles, but the poles also carve me into what I am now. My work is me.” It is important to note that Waharoa is also a kind of self-portrait, replicating the designs of Nuku’s own tattoos. In Maori culture, tattoos (or tā moko) are more than just surface designs; they reveal much about a person’s identity, lineage and connection to place. In other words, they do not just cover the surface of the body (like western make-up), but reveal something essential from within. Rather than just offering site-specificity through transparency, I wonder if Nuku isn’t getting at something more profound: critiquing the impossibility of the minimalist project through the assertion of peculiarly Maori sense of self-hood, objecthood and space. This is clearly what is at stake in his invocation of connectivity between the art object and its surrounding space; the union of earth, sea and air. While Nuku’s invocation of innovation sounds decidedly modernist, rather than partaking in the universalism of late Modernism, Warharoa offers exactly what the title suggests: a glimpse at a radically different way of seeing the world. In its transparency, Waharoa does not proffer a single, overarching world-view, but many shifting, disparate and mismatching ways of seeing and valuing the same world.